MainAll NewsMiddle EastNetanyahu envisions 'three more Israels'? Outlining vision for countering Iranian conventional threat, prime minister curiously suggests 'Israels' near Afghanistan, Libya and Yemen. He made the curious statement in the course of a long reply to a question by the host, AEI Senior Vice President of Foreign and Defense Policy, Danielle Pletka, about the implications of the deal signed with Iran. 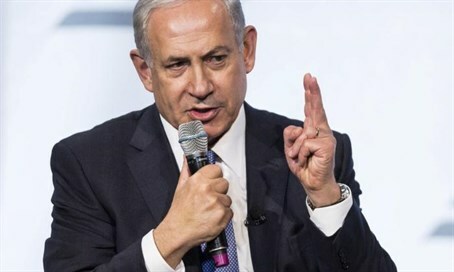 Netanyahu laid out three things that need to be done – presumably by the US and the West – which he said he had discussed earlier in the day with President Barack Obama. The first of these, he said, is to "keep Iran's feet to the fire and make sure it doesn't violate the deal." The second thing, he continued, is to prevent Iran's conventional aggression. "Remember," he said, "Iran is arming Hezbollah, trying to build second front in Golan, supplying Hamas in Gaza and Islamic Jihad with the technology of attack drones, acting in Yemen, trying to undermine Jordan, you name it. Also building an arms industry 50,000-man strong that produces submarines, satellites, precision rocketry advanced weapons." Iran can pursue this conventional-arms aggression, he warned, if it's not met with countervailing force. And to this end – the US needs to support its allies and "the most important ally, the most important countervailing force for Iran is the state of Israel. Support Israel!" This was the point at which he laid out the "additional Israels" scenario. "The president and I discussed today an MOU, a memorandum of understanding for American military support for Israel for the next ten years," he said. At the 33:00 minute mark, he then asked his audience: "Imagine a Middle East without Israel. What do you think would happen in our immediate vicinity? I'm the foreign minister so I have to be diplomatic," he answered. Netanyahu is currently also acting foreign minister. "I'll leave it to your imagination. Now imagine a Middle East with three Israels: one in Afghanistan, one in Libya, one near Yemen. It'll be a far different situation. The support for Israel that I'm talking about. Well – the United States supports Israel to the tune of 3 billion a year. "You spent on the wars in Afghanistan and Iraq, a trillion and a half. So that's five centuries' worth of support for Israel… We're an ally that doesn't ask for any American troops… We can defend ourselves, we just want to have the tools. So I think the second thing in fighting Iran is getting Israel the tools to defend itself and deter Iran." The third thing that needs to be done against the Iranian threat, he said, is to bring down its global terror network.